I am brainstorming ideas of things to have for sale in my Cabin, for Gatherings that I will be hosting. 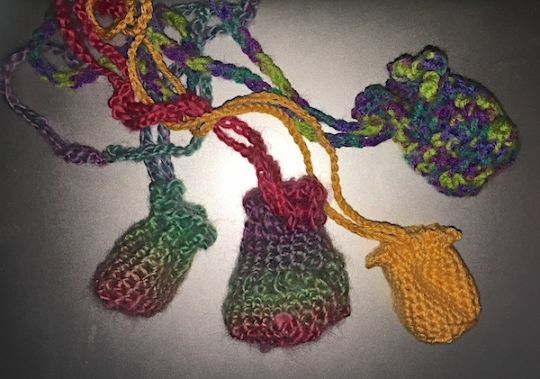 One idea I had was mini-pouch-necklaces, in which people could place things that they found and were attracted to during their walks in my gardens. These aren’t fancy but I thought that I’d best start with simple! The orange one has a hair elastic worked into the top. I like it but the elastic size leaves too big of an opening… not sure if I would want to work with a smaller elastic though.